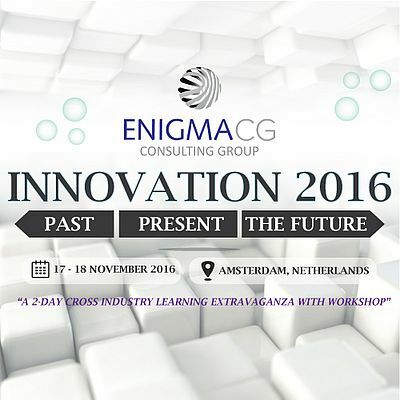 Innovation 2016: Past, Present, The Future organised by EnigmaCG from Nov 17-18, 2016 in Amsterdam, Netherlands will be the platform for cross-industry individuals keen to know more on innovation from Innovation Experts, Innovators, Scholars, Investors, Product Development Executives and leading companies like - Reckitt Benckiser, GE Healthcare, Orange, Bayer Pharma, Thales Group, UNICEF, AirFrance, NATO C3 Agency, DuPont, Swarovski, Fujitsu, Phillips, Janssen Research & Developments etc. driving Innovation. Innovation is an effective and profitable means for any business to revolutionize, reduce costs, accelerate time to market and create new revenue streams for the company through the launch of a new product of service. Regardless of the sector your company works in, be it Pharmaceuticals, Banking, Retail, FMCG, Defence & Aerospace, Automobile, Telecommunications or IT , the insight and expertise offered at this event will be invaluable. EnigmaCG’s event on innovation via its expert speakers and panel of judges will deliver the highest quality content, address past and present topics related to innovation of products and services with case studies which have proven to be success stories in the market today and showcase what they can do in the future. Debate: Open Innovation v/s Closed Innovation – which paradigm will dominate the future? Interactive Roundtable Session: Cross industry experts come together to share their findings in Innovation and answer ‘How Innovation works in different industries’?